More Subscribers to Gleason Solutions Magazine – Hayes Marketing Services, Inc.
Print’s not dead, and people haven’t stopped reading. Not if reaction to our most recent corporate magazine is any indicator. 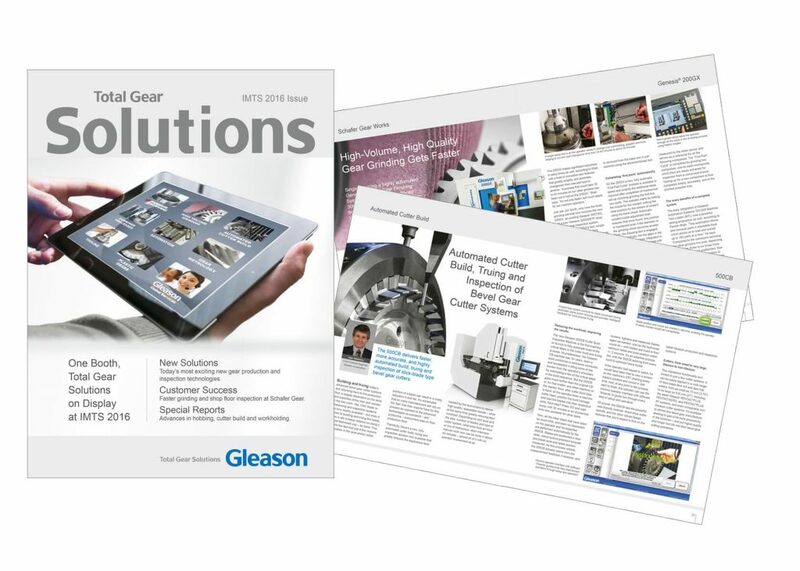 Hayes Marketing publishes Gleason Corporation’s Solutions magazine to target thousands of prospective customers hungry for new gear manufacturing solutions. It’s riveting, cover- to- cover reading if, like most of Gleason’s customers, you’re into gear hobbing, power skiving, or Barkhausen noise analysis. Just another way we’re working to differentiate the Gleason brand — by digging deeper and telling a more compelling narrative about our client’s products. Ready to tell your story? We can help. Contact us today. Yes, we’re probably over-caffeinated, but that’s a good thing. It means we’re highly energized, hyper-alert, up late and ready for your call. If your marketing’s feeling a little tired, or your brand needs something stronger, contact us today. Hayes Marketing’s unique approach to print, broadcast and digital media is a combination of science and art. With many years of media buying experience, we are expert at the science of data analysis, drilling down into gross ratings points and CPM, targeting advertising to fit audience demographics – and separating the media wheat from the chaff. But crunching numbers is only the half of it. Working off of rate card and extracting more reach and frequency, better rates and more value-added is an art that few practice as effectively as Hayes Marketing. While we don’t set out to strike fear in the hearts of our media reps, we’re pretty sure their heart rates go up when we sit across the table to start negotiating on behalf of our clients. Word on the street is, ‘No one reads anymore’. We don’t buy it. A more accurate description is that there are far fewer writers today that have the training and talent to tell their clients’ stories. Trust us: your audience is out there, hungrier than ever for relevant content about product advantages, new capabilities, and ways that you’ll help them solve their problems. That’s why we dig deeper, write more convincingly, and deliver compelling content through more channels. If you’ve got a great story that’s not getting told, then we’re your agency. There’s a reason for the hefty price tag most full-service ad agencies charge: there are a lot of mouths to feed. The principals at Hayes Marketing learned their trade with larger agencies and media companies – and then built a better mousetrap. The full service ad agency landscape is changing, and that’s a good thing for clients. In fact, many agencies are starting to look a lot like Hayes Marketing. Years ago, we made the decision to pare back on things that weren’t of direct benefit to the client. Like expensive offices and layers of administration. We saw the financial sense in outsourcing to expert ‘technicians’ for things like web development — while keeping the really important ‘cerebral’ functions like writing, design, account services and media management in-house. Full-service doesn’t have to mean ‘expensive’. Just ask our clients. Most larger agencies are like dinosaurs: too big to react quickly, too expensive to “feed” on a regular basis and less imaginative than you would expect. By comparison, Hayes Marketing is remarkably affordable and easy to work with. When you hire Hayes Marketing, you buy what you need, when you need it, usually on a purely project basis. And while most agencies take a time-honored approach closely akin to saturation bombing—expending vast resources in hopes of eventually hitting something—Hayes Marketing prefers the surgical strike. We’ll lay out a strategic plan, clearly define the tactics and deliverables, and tell you what it will cost up front. The only surprise is generally a pleasant one when the results start coming in. Next time your agency opens a strategic planning session with, “So, what do we want to do?” fire them on the spot and call Hayes Marketing. We do our homework, and come prepared to offer bold new strategies and execution right out of the box. That’s because we’re marketers first. In our world, form follows function. Even the best creative is gratuitous if it’s not serving the greater purpose. What makes products and services unique? What competitive advantages do they have vs. the competition? What market segments offer the best opportunities for growth? How can we differentiate our clients’ brands from their competitors? Ultimately, how are we going to help grow marketshare? It’s amazing just how quickly great creative comes together when it’s built on solid strategic thinking.